I try to pare down. Really. It’s not fun to lug a lot of stuff around an airport or to try and fit it all in my small allotted space in an airplane. But there are certain items I absolutely need at my disposal during a flight and these items can’t be buried in my roller bag. Beyond the obvious – identification, wallet, cell phone – I’ve come to realize I can’t be as minimalist as I would like to be. Computer: It’s a MAC and I’m dependent on it for almost everything. Movies, writing, photos, and of course internet are all at my fingertips. 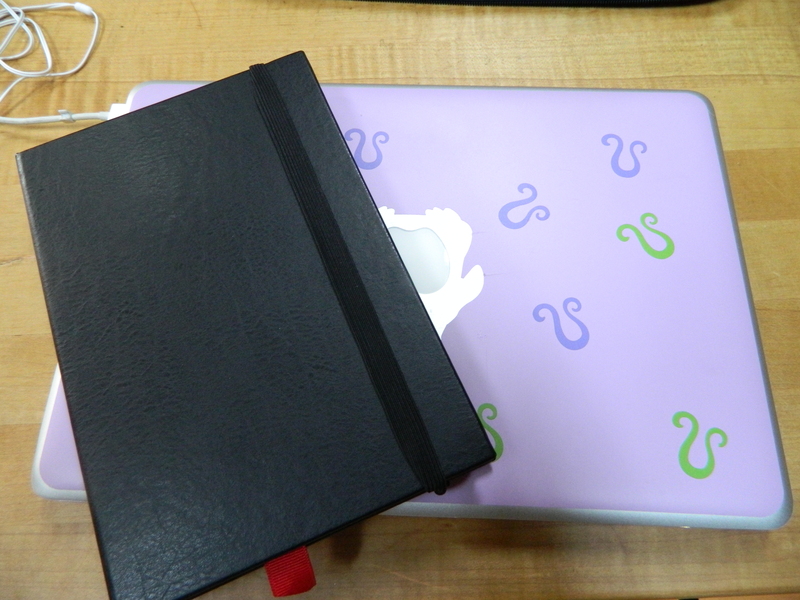 I wish it wasn’t so indispensable, but it is so I bring it. Earbuds so I don’t disturb others with my Melrose Place reruns and the DC cord so I stay charged up are necessities. E-Reader: The Nook I got for Christmas is my latest techie obsession and now I won’t travel without it. I’m a very fast reader and during an average length flight I can go through a couple of paperbacks. Times that by 2 and add a few extra to read while I’m at my destination and my luggage used to look more like a bookshelf. I’m very happy to jettison that extra baggage. 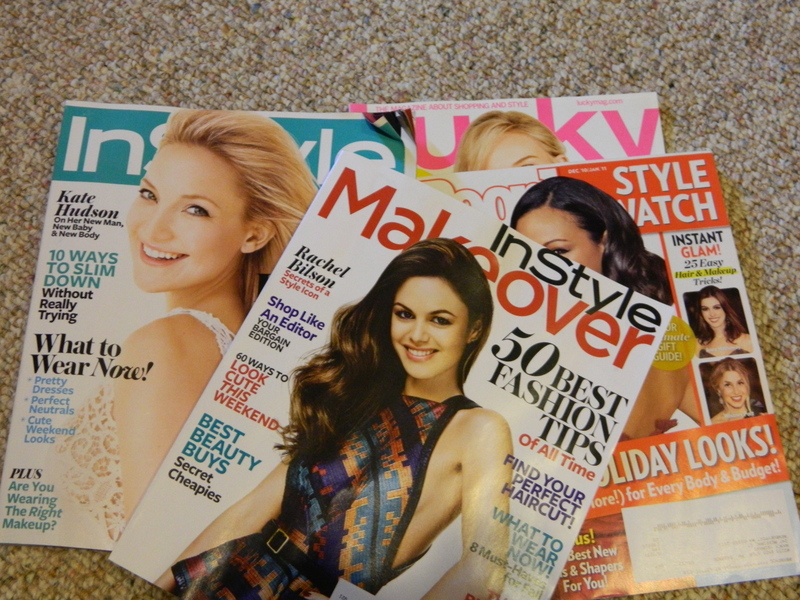 Magazines: I know, I just said I’ve transitioned from paper books to an e-reader. But I sometimes feel the need for reading material that’s a bit mindless and fluffy. Tabloids, fitness and style magazines fill the bill perfectly. My trick for not letting them take over…when I’m through reading one I leave it in the seat back pocket or in the airport terminal for someone else to enjoy. Music: Sometimes I need some shut-eye, but don’t want to sleep. 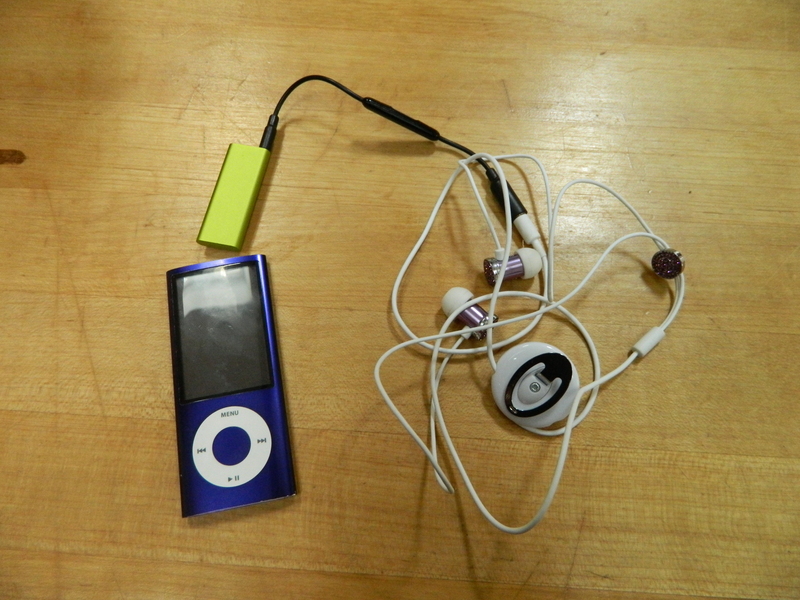 My newly loaded IPod – yes, I sort of just figured out how to load music onto it – is just the thing. I have the Nano filled with audiobooks and podcasts, Pilates workouts and just plain music. I sometimes bring my IPod Shuffle too if I’ll be running at my destination. Overkill maybe, but they’re so tiny and I’m the type of person who doesn’t like to put all my eggs in one basket, or all my music on one device. If one gets wet or dropped or the battery dies I’m not completely lost. 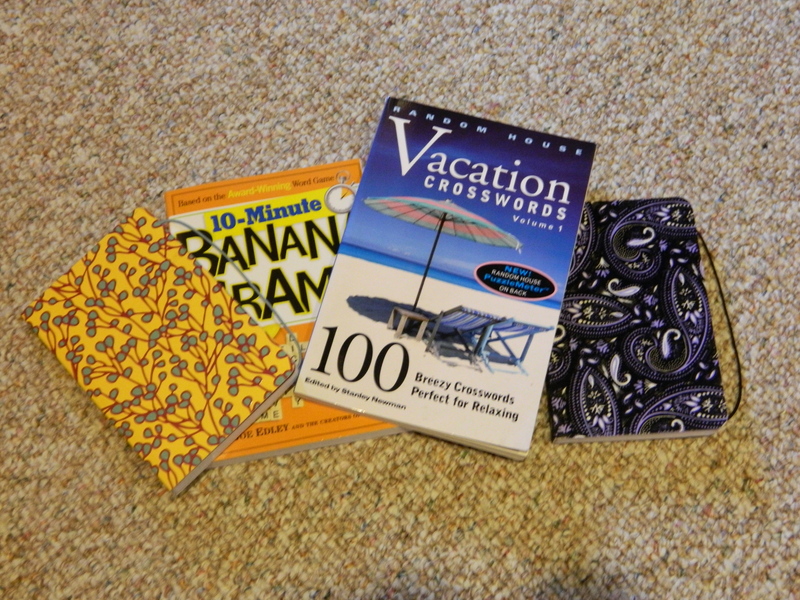 Mind Games: In case I get bored with the books and magazines I bring a book of crossword, Sudoku or logic puzzles. I don’t usually last long at them, but they break up the monotony quite well. In-Flight Comfort: I’m not the kind of traveler who needs to bring her own pillow with her on a flight, but I do like some comforts. I’m always cold so a lightweight wrap comes in handy. Earplugs and eyeshades block out the audio and visual disturbances. 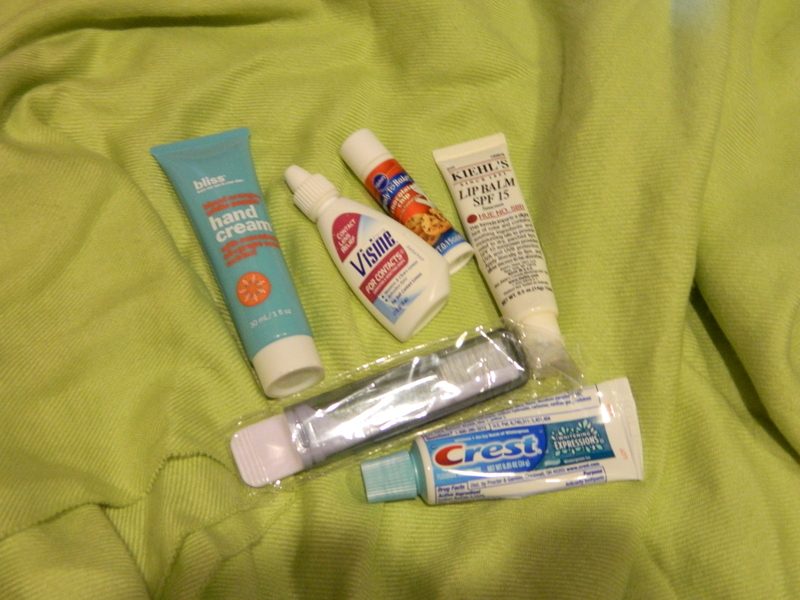 Some lipbalm, toothbrush and toothpaste are absolutely necessary. Food: I’m rarely not hungry so one of my nightmare scenarios is to be stuck on a long flight without a snack. I try to be thoughtful of other passengers in that tiny, enclosed space, so nothing stinky or messy comes with me. 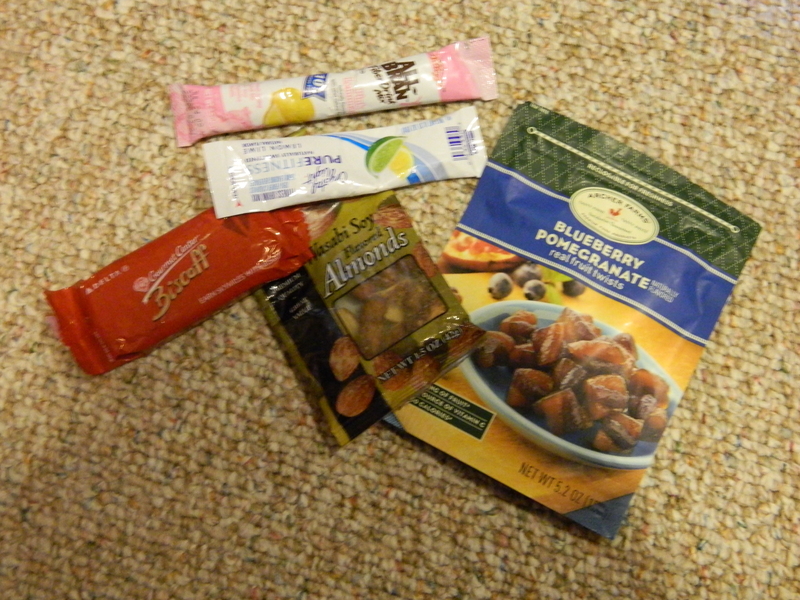 Wasabi almonds are a favorite, cookies and crackers, dried fruit, and I always need some of those powdered drink packets to flavor bottled water. I’d rather save my appetite for the food at my destination anyway! The Bag: I keep trying, but still haven’t found a carry-on bag that I’m in love with and that suits my purposes…any suggestions? And tell me what you absolutely can’t live without on an airplane. Funny you should say that! I was talking to a pilot friend about paying an arm and a leg for a really nice, durable carry on and she advised to just get a cheap one because they go through so much abuse that no matter what you spend they will get trashed anyway. I LOVE the leopard one! I just got a pair of leopard print rain boots so the print is one of my faves. I’ll definitely check out Forever21 (love that store for all kinds of trendy items too) and take a look before my next trip. Thanks for the info!